Britain has its own geographic color form, Vespa crabro vexator Harris, 1776. 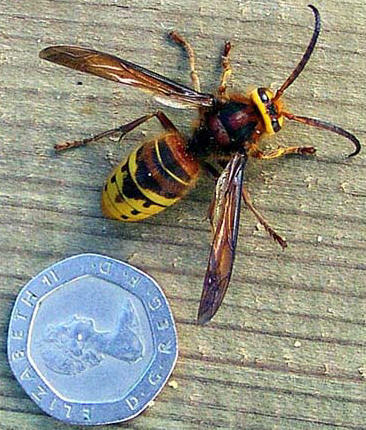 The hornet is predominantly a southern species and can be found roughly south and east of a line running from the Severn to the Wash. Hornets are not rare over much of their range, but not very common either. The New Forest (Hampshire) is probably their last stronghold in the UK. Vespa crabro vexator is easily distinguished from the other european color forms by the yellow head and the reddish-brown stripe on the second gastral tergite." 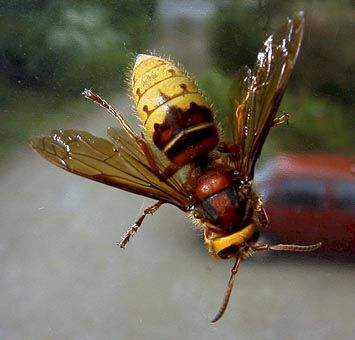 Climate change is thought to be causing the return of Britain's most formidable flying insect, the hornet. 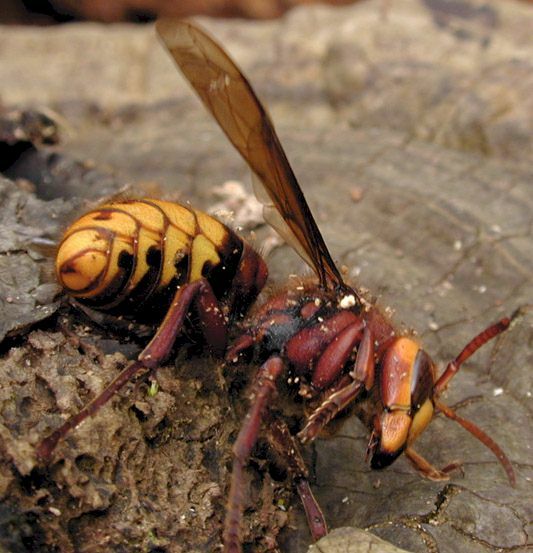 Up to an inch and a half long, weighing as much as a harvest mouse and with a powerful sting, the black and yellow-striped hornets died away during the 1960s after a series of cold, wet summers. Now Vespa crabro is on the wing again and milder weather is blamed. 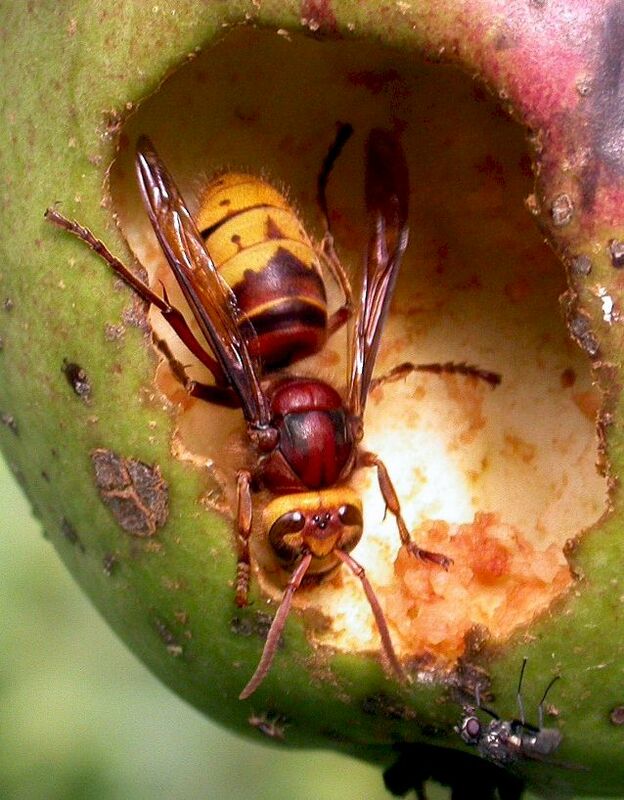 David Baldock of the Bees, Wasps and Ants Recording Society, says in the journal British Wildlife that it has been an "extraordinary year" for hornet sightings, with some reported in south-west Surrey, a historical first. Alan Stubbs, chairman of the insect conservation organisation Buglife, said: "East Sussex is another area where they didn't occur before but they certainly are there now. I have seen a lot in East Grinstead. 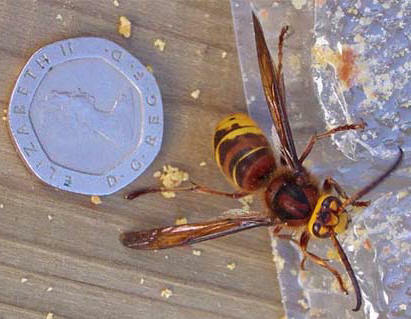 "Personally, if hornets nested in my roof void, I'd welcome them. 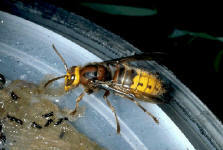 Their stings are for paralysing their insect prey, although they can be used defensively, but only as a last resort. They don't go out of their way to attack people and are actually quite docile; they won't harm you if you don't harm them. There are benefits to people in that they eat insects such as house flies. They are magnificent." 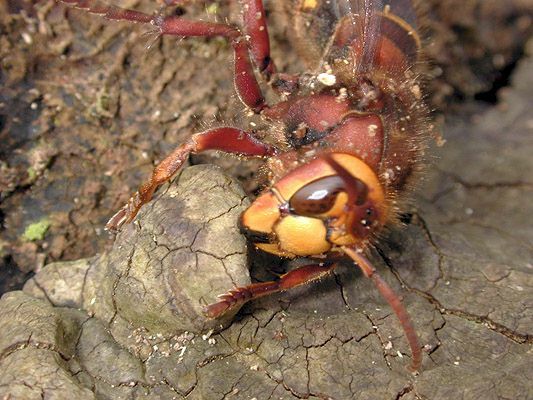 Although I am still not fully convinced that these changes in hornet population density and distribution ranges are mainly caused by climatic changes, there are some other interesting reports. 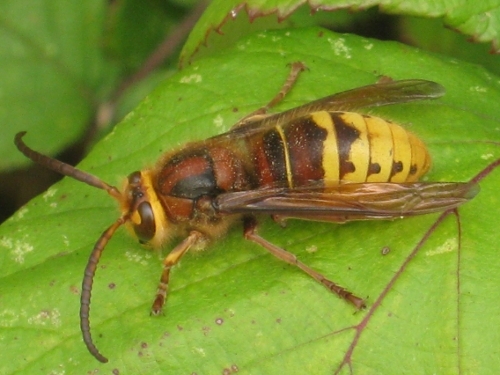 During the 1990s the hornet returned to southern Finland (it disappeared from Finland in the 1940s after a sucession of cold summers) and is now obviously spreading northwards, although such observations are rare. A finnish entomologist told me about a specimen collected this summer near Jyväskylä (at about 63° N latitude), which is one of the most northern sightings for this species ever.